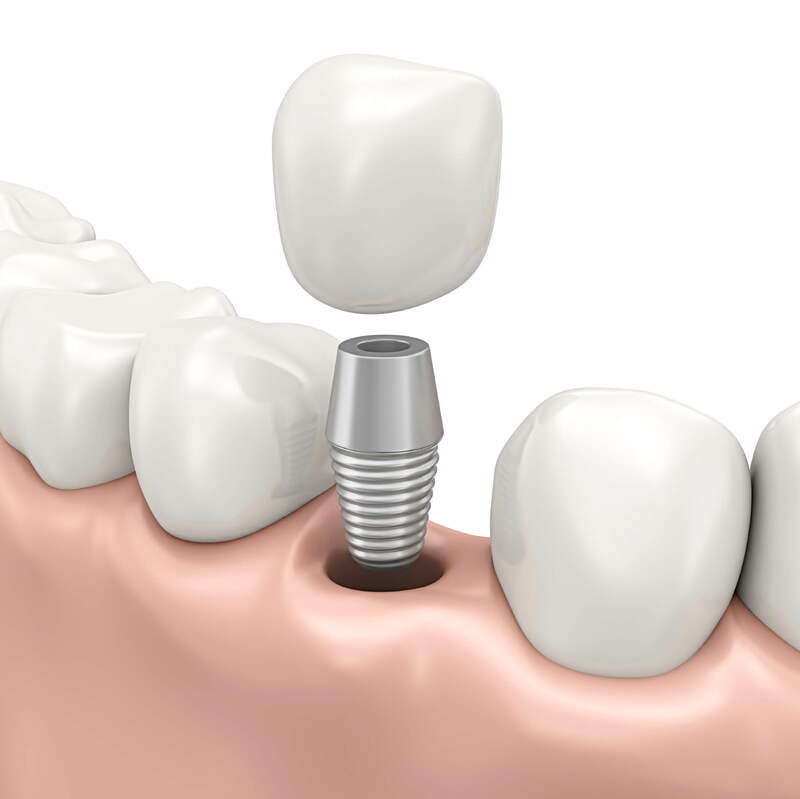 For patients who are missing one or more teeth, having a full smile is possible with dental implant restorations. Working with trusted implant placement specialists in the area, our Fresno dentist, Dr. Jack Oberti provides implant restorations to replace the missing teeth in your smile. Whether you’re missing one or a full arch of teeth, we have implant restoration options to fit your needs. Ready to complete your smile? Contact us today! Made out of biocompatible titanium, implant posts are placed in your jaw by a trusted oral surgeon. We then fabricate the abutments and the restorations to replicate the visible part of your teeth. Due to the integration of jaw bone with the post, the implant can support any restoration you need. Depending on the number of missing teeth in your smile, the number of implant posts and the type of restoration varies. With single unit dental implants, Dr. Oberti provides custom porcelain crowns that are affixed to implant posts. With our lab just two doors down from our Fresno practice, we are able to choose the specific shade to ensure the restoration matches the rest of your smile. If you’re missing all or multiple rows of teeth, we provide implant supported bridges in our Fresno dental practice to restore function and aesthetics. Like our implant supported crowns, our bridges are fabricated to blend seamlessly with the rest of your smile. Implant supported dentures provide the stability desired from a traditional prosthetic. Dentures and partials may require the use of adhesives and suction to stay in the smile, but with dental implants, there are no concerns of ill-fitting dentures falling out or slipping in place. If you have missing teeth or are suffering from loose teeth due to decay or periodontal disease, dental implants and their restorations are the ideal replacement option. After an in-depth consultation with Dr. Oberti, we determine what the best option is to replace your missing teeth. We refer patients to a specialist to have the implant posts loaded. In order for the implants to properly be supported by the jaw bone, we invite patients back after three to four months to check the progress of healing. We take impressions of your teeth prior to placement, and we fabricate your restorations or reline your dentures to be supported by implants. We have a trusted lab technician who fabricates your restorations to look and feel like your natural teeth. Follow-up appointments are then made to have the abutments and restorations affixed to your implants, completing your treatment. Dr. Oberti is dedicated to providing his patients with tooth replacing options like implant-supported restorations in Fresno. For more information about our treatments, or to schedule a consultation, contact us today!